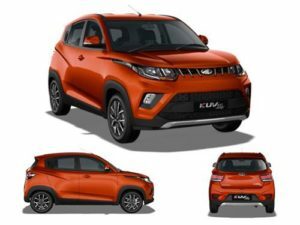 The KUV100 which stands for Kool Utility Vehicle One Double-Oh was originally launched in January 2016 and had good exterior styling to begin with. However, where it was left wanting a little was detail that can grab attention from all quarters. On the KUV100 NXT this comes in the form of a sporty, more muscular look. Up front is now a more aggressive grille that also extends lower with its incisor-like chrome slats. This remedies the plain looking top half of the older KUV100 bumper. The NXT bumper now has a more resolved look, thanks to the honeycomb-pattern black grille surrounded by more pronounced fog lamp bezels in body colour. At the bottom of the front and rear bumpers is a silver faux bash plate.The sunglass-style wraparound headlamps get the house treatment too, with dual chambers for the low and high beam units. The stem of the left headlamp features KUV100 NXT badging, while the right sports mFalcon badging. Red highlights from the older KUV100 have now been replaced with chrome details. Move to the side, and the KUV100 NXT has a more visually-balanced look than its predecessor with the front bumper extension reduced, and the rear extended a tad bit. This change results in the KUV100 NXT gaining 25mm in length over the older KUV100 at 3,700mm. Thicker plastic cladding runs around the flared wheel arches and the bottom edge of the NXT, which also gets new 15-inch two-tone diamond cut alloy wheels. Three new two-tone colour options feature a black roof and pillars, in keeping with which the C-pillar mounted rear door handle is now black to enhance the two-door look.The electrically-adjustable rear-view mirrors now also sport integrated side indicators. Move to the rear, and the clear lens double-barrel LED taillamps are the first thing to catch your eye. The new roof mounted spoiler also wraps around the rear windshield better. The NXT ‘evoques’ the feeling of larger international offerings now, especially from the side, albeit in a pocket-friendly size. Just like the Anniversary Edition, this KUV100 NXT gets all-black interiors in the top-spec K8 variant, which enhances the cabin’s appeal. The overall design is familiar, but the centre fascia is redesigned and the layout of the manual air-con buttons is new. The biggest difference here, however, is a 7.0-inch touchscreen borrowed from the TUV300. It gets navigation and is compatible with the Mahindra BlueSense app, but misses out on Android and Apple connectivity. The infotainment menu is very easy to operate, and the touch sensitivity and responsiveness are surprisingly nice. The screen also doubles as a display for the park assist, but the KUV100 misses out on a reversing camera. The other premium feature that this update gets is electric folding mirrors.Possibly the most unique feature of the KUV100 is its six-seat configuration. But it’s not very practical sitting three abreast in the front, unless the middle passenger is a child. There’s really not much place to speak of with the centre console cutting into knee room in the middle, and shoulder room too is a bit tight. The middle-seat backrest doubles as a really comfortable front armrest and that’s the best way to use it. The KUV100 is as practical as ever with several storage bins including a couple of hidden compartments. The rear-seat space and the 243-litre boot remain unchanged. 1.2-litre petrol and diesel engines power the KUV100 NXT. These new engines are three-cylinder ones and they are the same when they were launched on the micro SUV. The petrol engine has decent power and is good enough for daily usage. However, it has some amount of vibrations at low engine speeds, which means it will miss out on the refinement. These are felt the most when you are waiting on a red light. There has been some improvements in the NVH of the petrol engine and it seems a tad better than before. The diesel engine was always good, but the biggest let down was its hard clutch. From all the product presentations we have gone through it doesn’t say a word about it. No other reviewer would have noticed this, but your clutch has now become a lot lighter. Before driving in traffic meant your clutch becoming hard and making it difficult to drive on a daily basis. This issue has been taken care of. The company claims to have reduced the diesel clatter too with better insulation. We aren’t certain of that. When you begin to drive this engine, you will not feel at any point that this is just a 1.2-litre engine. It is peppy and it has the punch even at low engine speeds. This makes it drivable too.Mahindra KUV100 NXT tail lampKitna deti hai? Our favourite question. The petrol engine returns about 11-12km/l in the city and out on the highway it goes up to 15km/l. On the other hand, the diesel engine will return close to 15km/l in the city and the number jumps up to 19km/l on the highway. These are the real world figures. The KUV100 NXT gets no structural alterations or changes to the suspension. It still rides and handles like before and while it’s no enthusiast-pleaser, it does well for general point A to point B transport duties.Parking or taking quick U-turns are quite easy and they’re one-handed affairs. It does weigh up nicely as you speed up. The steering isn’t particularly communicative though. This is a tall-hatchback and behaves like one too. Throw it into a corner and there’s evident body-roll, and since the steering won’t tell you much, it’s best to not get overzealous in the ghats.The little Mahindra gets disc brakes at the front and drum brakes at the rear. The brakes bite in very early and stopping power is adequate. However, there is a certain amount of nosedive under braking.The suspension on the KUV100 is on the softer side. While this does cushion out most of the bumps and undulations on the road, it also manages to toss the passengers around a fair bit. For example, going over a speedbreaker at around 10kmph saw all occupants in the car sway side to side. As you’d expect, it’s a comfort-centric setup and not one that prioritises dynamics. The Mahindra KUV100 NXT comes available with dual airbags on the plus variants in the entry and mid-level along with the range topping variant. Other safety features available on the KUV100 NXT are child safety locks on the rear doors, anti-slip clips for driver side door mats, ISOFIX child seat mount on rear seat, engine immobiliser, anti-theft security alarm, automatic hazard warning lamps on crash and speed sensing automatic door locks. Mahindra has spared no expense to make the KUV100 NXT stand out amongst the crowd and which is why you see it filled to the brim with features. Among the various features incorporated outside and inside here are a few notable ones worth a mention. On the outside the KUV100 NXT gets follow me home head lamps and lead me to home head lamps, head lights height adjuster, rear wiper, rear defogger and manually adjustable ORVMs. The cabin gets a 12V power outlet, door pockets, 1 litre bottle holder in all doors, interiors rear view mirror, rear parcel tray, LED interior lamp etc. Moving on to the verdict. The KUV100 NXT comes at a price tag that is similar to the Maruti Suzuki Ignis and the Hyundai Grand i10. For the same price, the KUV misses out on features like push start and stop button, Android Auto, Apple CarPlay and even reverse camera. But then what you get is a vehicle with the SUV-stance. This is a unique proposition and we can trade off these features for it. In short, the KUV100 NXT is a great product to consider for the Indian car market and we reckon it is a good choice to buy.